Just before we launched our Hopster iPhone version we were perusing the App Store and to our surprise, found another app also named Hopster! You can imagine our reaction. Maintaining the clarity of our name is one of the most important things for us, especially as it’s what lets parents find us easily on the App Store. Seeing another app using it when we were about to launch in the same store with the same name was very worrying. As with any brand name, you want it to be protected and unique to you – not least so your potential users don’t get confused, or think both apps are from the same company. 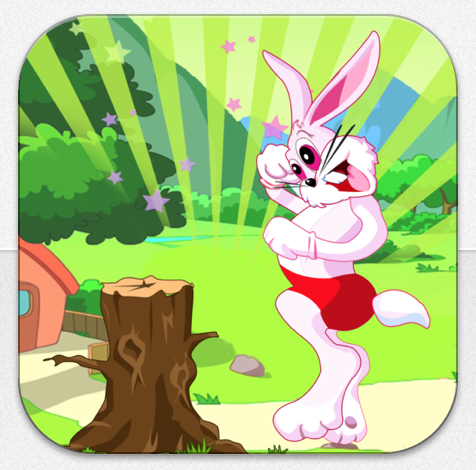 What made it even more tricky was that the “other” Hopster app was also a kids app! And not just that, it was the creation of a six year old boy and his father, who runs an app development company called GoingApps. It features a little rabbit who hops along, avoiding tree stumps and low hanging branches. All new Thumpster keeps on thumping! That this sidescroller had to be called Hopster was an unfortunate coincidence, but luckily, Jon and his son were happy to change the name of their cute app. The app is now back on the App Store under the new and fabulous name ‘Thumpster‘. Check it out and let them know what you think of their app. As for us, we’re looking forward to many great new apps coming from GoingApps – and who knows, maybe we’ll work together with Jon and his son at some point in the future!